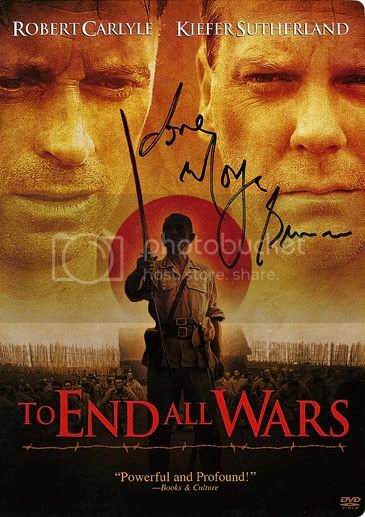 I Heard Moya Brennan sing a couple of songs for the music score of the movie, "To End All Wars" According to the credits, the titles are "Mo Mhiann," "Healing Heart," "La na Cruinne "(end of time) "Find the place," and "I will go". I Would have to go back and watch the movie again to be sure, but I think one of the Gaelic songs was just before the crucifixion scene, and one was at the credits, . There where probably other instances, But I can't remember at present. Why in the heck are there so many polls on this forum? Vegetarians eat vegetables. Humanitarians frighten me. Once I asked Moya after a concert if a CD with the soundtrack of this movie exists. Unfortunately not . On the 22 January the movie was on German TV again. There is a scene with the Argyll and Sutherland Highlanders walking out of a castle and I was wondering which castle it is. The next day - the 23 January - I flew to Glasgow to the Celtic Connections Festival for 3 days. Sunday night after the DERVISH concert (morning ) I was in the festival club and there a man told me that it is easy to go from Glasgow to Sterling Castle. So I did just some hours later. But I had no clue about Sterling Castle. I had a guided tour there. When we were in the Inner Close the guide told about the Argyll and Sutherland Highlanders and the museum there. I couldn't believe it. This castle was their regimental headquarter and the scene in the movie was filmed at Sterling Castle. Photos from the castle you can find here http://forums.moyabrennan.com/viewtopic.php?t=3278. When I posted the link in the forum I had no time to write a story to my trip to Scotland. Because to write in English takes a lot of time to me. Welcome to the forum, Catch22! Many of the polls on the forum go way back, and then get found again from time to time, so as more people post, they become more obvious again. I've been here just under 2 years now, and in that time, not many new ones have popped up! Eventually, they will probably just "fall off" the board - but most of the threads these days are discussions! Hope you enjoy your time with us! Susann wrote: Once I asked Moya after a concert if a CD with the soundtrack of this movie exists. Unfortunately not . Dab051176 wrote: Many of the polls on the forum go way back, and then get found again from time to time, so as more people post, they become more obvious again. I've been here just under 2 years now, and in that time, not many new ones have popped up! Eventually, they will probably just "fall off" the board - but most of the threads these days are discussions! Aha! So that explains it! Dab051176 wrote: Hope you enjoy your time with us! Welcome to Moya's forum 'catch22', you'll soon get your feel around here! It is a shame that the soundtrack to this film was never released as there are some truly wonderful songs on it. If I remember correctly the film was due to be released in late 2001, and then we all know what happened that September and as such it was felt that it wouldn't be an appropriate film to be showing in cinemas. I remember it did show in a few places though, but without the widespread showing of the film a soundtrack album wouldn't be very successful. And as for the polls - until a few weeks ago the forum was set to delete any topics unused for six months. For some reason the forum was very fond of the polls and refused to let them go, and now we have piles of polls! Just as she was autographing the item, she commented something about people have been asking her about it. I boldly asked her if its soundtrack would ever be released. Her response was that she has re-recorded TWO of the tracks from the film with Cormac and will be included in the upcoming release. She said nothing more. She sounded very enthusiastic about it, though! Thanks excellent news about the re-recordings - thanks for sharing! Just throwing the lyrics in quick. The first song I've almost got (I hope! ), Go Brách (Mo Mhian), there are a ton of mistakes! I hope I've got the general idea though.. Both the songs are on the "Harps & Voices" CD right? I know for a fact that one of them is because Moya told me that it would be on there when I saw her live right before the My Match Is A Makin' CD came out.